Strollers! I actually listed strollers as one of the 10 things you can leave off your baby registry and got a bunch of feedback from my readers. Some of you agreed with me while others disagreed. 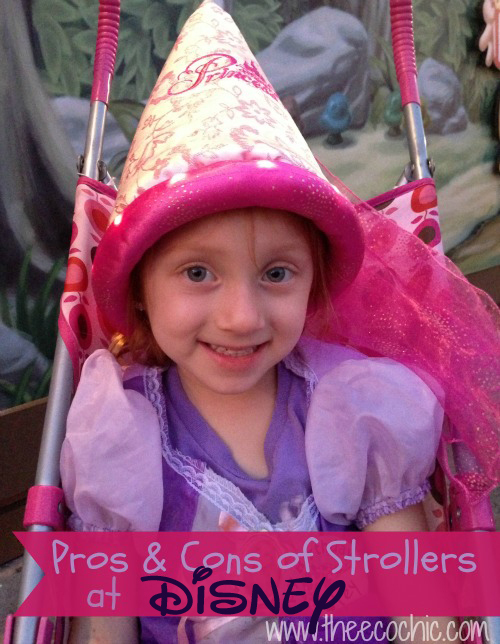 I wanted to take a few minutes and talk about strollers and some of the pros and cons of using them at Disney or anyplace you are traveling to during your day. My family has never been a big stroller family. We don’t live in a town where we can walk to the town. The only place I could walk to would be around the neighborhood – not really all that exciting. We’re not big shoppers or mall rats. We did have a stroller that we got when my first was born but it sat in the garage for almost 10 years and was only used about 10-20 times over those 10 years. When my kids were little we tried to travel with the stroller and we did venture to the mall a few times. We quickly learned that the big stroller was not right – for us! We did however use our cheap umbrella strollers (we lost one many years ago with my son) a lot more than the big stroller. We didn’t even have a big fancy umbrella stroller. There were no pouches or sun shades – just a seat. Of course they only work once your baby can support their head and neck which is usually around 3 months of age. What we did use a lot more was our soft structured baby carrier. We had an Ergo (still do actually) that we used almost everywhere we went. Both my husband and I wore our daughter equally and if our back got tired we would switch off. It was great for the grocery store, ball games, airports, shopping, and yes – even Disney. Small babies sleep a lot and a stroller gives them a nice safe place to sleep while you stroll around the park with your family. Strollers usually have pockets, caddies, and places to stuff things. This is good (and bad) if you have a lot of stuff to carry with you. Babies and kids get tired of walking and can get heavy. It’s nice to have them rest in a stroller so you don’t have to hear them complain about walking. Strollers are heavy and cumbersome and take up a lot of space. Not just in the car but on the sidewalks as well. Disney can get really crowded and you feel like you are always dodging other strollers as well as people. Strollers aren’t allowed everywhere. You spend half of your day finding a designated parking spot for strollers. When you come out of an attraction your stroller has probably been moved by the cast members trying to keep the stroller area tidy. Strollers may need to be folded down for some rides. When taking the tram from the parking lot to the parks you’ll need to take your baby and your belongings out of the stroller; fold the stroller; and try and fit it on the tram. Then you’ll have to unfold and restuff your stroller when you get to the next stop. Rides such as the WDW Railroad (which takes you from one section of the park to the next) make it really challenging to load your stroller. This past trip a friend of mine took their stroller and we fought with it for a while trying to figure out how to get it through the turnstile (as there wasn’t a stroller gate to pass through). You can’t always see your baby. If you have a shade over the stroller you can’t always see (or hear) when your baby needs you. It’s loud at Disney and it’s hard enough to hear the person next to you. Your baby can’t see you. Babies like to feel safe and secure. Sitting in a stroller looking at people’s feet all day – especially in big crowds – doesn’t always allow for that safe and secure feeling that your baby wants. A solution – baby carriers! Safely hold your baby next to you (on the front or back) in a baby carrier. They will feel safe and secure and loved knowing that they are next to mom or dad. They will also be able to see everything that you see (and not people’s feet). Go anywhere you want! There aren’t many things you can’t do while wearing your baby. Get on a tram and go! Get on a bus and go! Get on the monorail and go! Walk into a show or restaurant and take your baby with you. No need to finding the stroller parking either! Hands are free! Hold hands with your partner, hold the map, hold a drink, or hold other children by the hand. Ahhh…the love! Walk freely without worrying about running over any heels with the stroller. You’ll move quicker too while dodging the other strollers. Sleepy baby? No problem. They can rest their head on your chest or shoulder and take a quick nap. 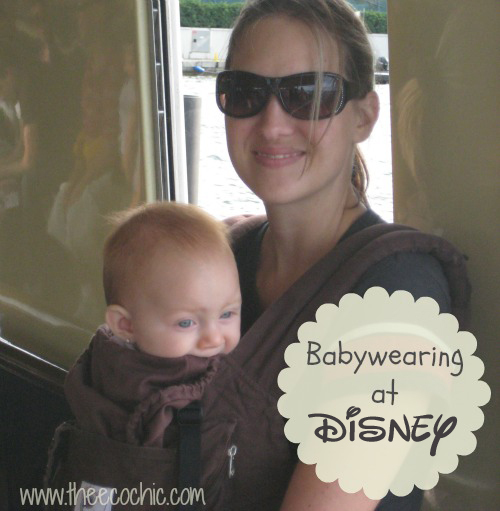 Carrying your baby can get hot in the summer so get one that is breathable for both you and the baby. When inside shows or restaurants use that time to take a break and allow yourself (and your baby) to cool off. Stay hydrated also. You’ll also become a pro at packing less. Most carriers come with pockets for phones, keys, money, and tickets. Pack only the essential items that you really need (diapers, snacks, etc) and keep the rest in the car. Share the carrying with your partner so that you both get equal time to love on your baby (and time to rest). We have found that while our daughter will still fit in her Ergo (barely) at four years old she is almost too large to be carried. This is when we have used the umbrella stroller for taking breaks around Disney. You may even find my almost 10 year old taking a quick seat – although he doesn’t really fit nicely in the pretty pink polka dot umbrella stroller. Note about baby carriers: I do not personally endorse or agree with Baby Bjorn style carriers. They do not hold your baby in an ergonomically correct position. 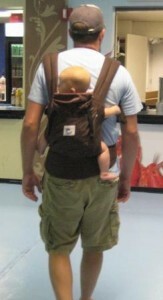 I posted a picture HERE that shows the difference between a Bjorn carrier and an Ergo carrier. Spend a few dollars more and get a good carrier that you and your child will be comfortable in. There are many other brands and styles that I do recommend like Moby Wrap, ring slings, and mei tais. For more information on safe baby wearing and how to find out which baby carrier is right for you visit websites like The Baby Wearer, The Baby Carrier Industry Association, and Babywearing International. What about you? Are you a stroller family? Do you wear your baby? Or a combination of both? Share your experiences with me by leaving a comment below. Disclosure: There are no affiliate links in the post and no company sponsored or endorsed this post. This is my own personal experience with strollers, carriers, and Disney. We’ve been passholders for several years (off and on) and I like to share my experiences with you. I would just like it noted that there IS a specific section on the Trams that you do NOT NEED to fold your stroller down for, just take your children out. I use the carrier while I am in a stroller-free zone but I don’t think I could ever do a whole day at Disney without one. It is too hot for me personally on a lot of the summer days to be carrying my sweet kids, as much as I love them, I don’t need the extra furnace like heat the produce on me the whole day. 😉 Whether it’s a breathable carrier or not, it’s still usually too warm. I have twin 13 month olds. so when im out on my own i have to use a stroller for a long length of time. if my husband is there, we do a combination, carry and stroll. now that i have an ergo baby carrier, (he has a camping style carrier) we will be carrying a lot more now. coming from experience, especially with a double stroller, being around crowds is awful with a huge stroller. i pack light, and just use an umbrella one if i can get away with it. at least a side by side, maclaran which is really like two umbrellas together make it a bit easier. i wish i could carry both of my kids! you can carry both! its called tandam babywearing google it! My son is 18 months old and we just got back from a trip to Disney last November, and we had a great time using the strollers you can rent at Disney. I would never take our own stroller to Disney because of the hassles you talked about on the tram. We always rent their strollers because it is much less hassle free. When we were not in the park, we used an umbrella stroller to get around the resort or let our little one walk around and hold hands with us. I really like our stroller right now. We have winter where we live and it’s nice to have a place to shove my coat if need be. We get quite a bit of use out of it in the warmer months since we live only a few blocks from the park. I do love wearing him, though. I need to master the back carry now that I’m expecting again. We went to Disney without a stroller a year and a half ago with my then-2-year-old, and it was NO problem – although everyone I spoke to looked at me like I was crazy for not bringing one. Looks like a decent stroller. I see so many nice strollers to buy. Not the case when I had babies. really helpful for us.